University of Chicago researchers will develop robotic arms that patients can move with their brains, thanks to a $3.4 million grant from the National Institutes of Health. “Our goal is to create a prosthesis that has the same dexterity and functionality as the natural human hand,” said University of Chicago researcher Sliman Bensmaia in a statement. The grant is part of a combined $7 million awarded to the University of Chicago and the University of Pittsburgh and its medical center that will allow researchers to continue developing brain-controlled prosthetics for people who have been paralyzed. In 2016, researchers showed how a paralyzed man was able to control a robotic arm with his mind and regain the sense of touch through his hand. The NIH grant will expand clinical trials to Chicago that will be led by Bensmaia, who studies touch, and University of Chicago researcher Nicho Hatsopoulos, who studies how the brain directs movement in the limbs. 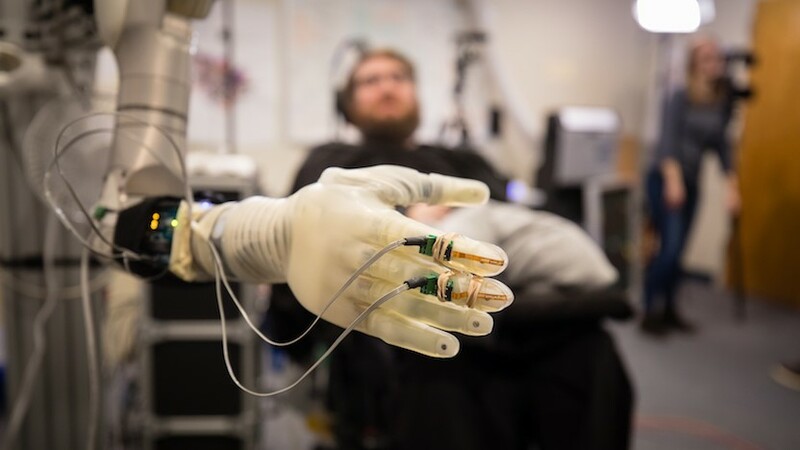 The prosthetics will incorporate years of research by Bensmaia and Hatsopoulos on how the nervous system interprets sensory feedback, directs limbs to move and perceives them in space. “Our project will attempt to solve the difficult challenge of controlling the hand when it comes in contact with and manipulates objects,” Hatsopoulos said in a statement. UChicago researchers, along with their colleagues in Pittsburgh, will refine previous work to incorporate greater dexterity and more precise movements into the prosthetics. The UChicago research team will also include John Downey, a staff scientist in Bensmaia’s lab who formerly worked with the Pittsburgh team; Dr. Peter Warnke, a neurosurgeon; and Dr. Raymond Lee, a physical rehabilitation specialist.